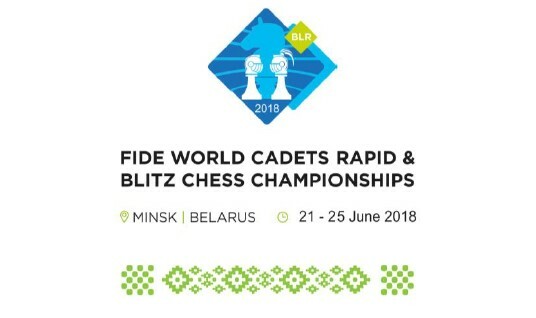 The 2nd FIDE World Cadet Rapid & Blitz Chess Championships 2018 will be held from 21 June (arrival) to 25 June (departure) 2018 at the Sports Palace in Minsk, Belarus. There is no limit of participants per federation in each of the categories ‐ U8, U10, and U12 (boys and girls). A player must not reach his/her 8th, 10th, 12th birthday, respectively, before 1 January 2018. The tournaments are based on Swiss System with nine rounds. If a player does not have an existing FIDE rapid or blitz rating, then his/her standard rating will be used, if applicable. The playing time for the Rapid Chess Championships is 10 minutes with an increment of 5 seconds per move starting with white’s first move. The playing time for the Blitz Chess Championships is 5 minutes with an increment of 2 seconds per move starting with white’s first move. The registration deadline is extended to 15 May 2018. A player may apply for the Chess Championships individually or via a National Federation. The Entrance Fee for both Championships is 70 EUR according to FIDE Financial Regulations. The Entrance Fee for each Championship is 35 EUR. Each player and each accompanying official/person shall pay the Registration Fee (30 EUR) at the moment of their registration. This Registration Fee is compulsory and confirms the player’s participation in the Championship. This payment includes official accreditation, identification, badges and organization costs. The Champions of the previous World Rapid and Blitz Cadet Chess Championships (2017) shall have the personal right to participate in the World Rapid and Blitz Cadet Chess Championships of the corresponding age category or a higher age category, if the above age requirements are met. These players are subject to free accommodation (lodging and breakfast) and waiver of the Registration Fee. Such players shall also be treated as invited players and have to be registered by their National Federations. Invited players shall pay the Entrance Fee according to FIDE Financial Regulations. Commission-free payments by credit cards VISA, MASTERCARD, Maestro are also accepted. Each participant will receive the Certificate of Participation. Special prizes may be awarded. On 23 June 2018 at 15.30, there will be a guided city tour for players and accompanying persons. The price is 20 EUR for adults / 10 EUR for children.